Raymond A. Bisson, LLS PLS, principal of Stonewall Surveying, has over 20 years of experience in land surveying and land planning. He is licensed in New Hampshire (#931) and Maine (#2388), and has completed many projects, including surveying the endangered Appalachian Trail corridor in Maine to protect it from development. In addition, he has completed surveys on Pease International Tradeport, and Portsmouth Naval Shipyard, as well as for shopping centers, landfills, conservation land trusts, large and small subdivisions, camp lots, homeowners and businesses. Over the past two decades, Ray has become well known for his critical eye and dedication to the surveying process. He has collaborated on a number of projects and is widely respected for his accurate and detailed survey plans. Ray has developed relationships with clients who have entrusted him with their business for years, including homeowners who felt comfortable leaving for vacation knowing that he would professionally and discreetly complete the project while they were away. He has also completed all types of surveys from small, large, easy, and difficult to sensitive and controversial. Ray strives for quality of work and dedication to the profession and clients. Ray earned his Civil Technology degree from the University of New Hampshire in 1990, obtained his license from the state of New Hampshire in 2005 and the state of Maine in 2006. 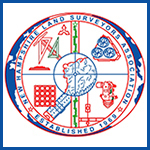 He is also a member of the New Hampshire Land Surveyors Association and the Maine Society of Land Surveyors. A strong love of the outdoors and an interest in history are some of the reasons Ray became a surveyor. He also enjoys camping, biking, skiing and boating with his family, and is an avid photographer.